While this recipe may seem long and fussy, it is very simple to put together. To save time you can prepare a few components ahead of time. 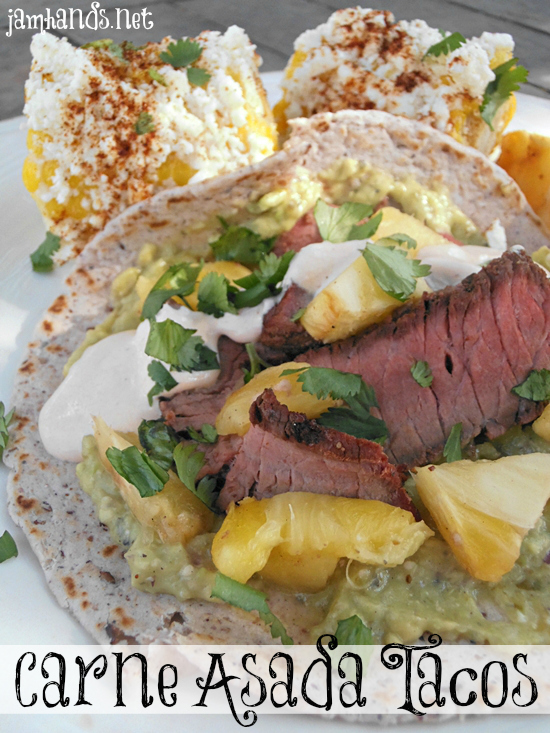 The combination of spicy peppers, grilled pineapple and Carne Asada is downright delicious. 1. Prepare the marinade for the Carne Asada. Let marinate in the fridge. 2. Prepare the Salsa de Aguacate and Chipotle Crema. Store in the fridge until ready to use. 3. Grill the Carne Asada according to directions below. If grilling the pineapple you can place the spears on the sides of the grill where the temperature isn’t as hot. 4. To assemble: Warm the tortillas. Add a layer of Salsa de Aquacate. Add sliced Carne Asada. Sprinkle with chopped pineapple, freshly cut cilantro and Chipotle Crema. 1. In a medium non-reactive bowl combine cilantro, vinegar, garlic, lime juice, oil, salt, pepper and sugar; whisk until salt and sugar and dissolved. Add flank steak and turn to coat well. Cover and marinate in the refrigerator for 4 to 24 hours, turning meat occasionally. 2. Remove steak from marinade, discarding marinade. For a charcoal or gas grill, place steak on the rack of a grill directly over medium heat. Grill, covered, for 17 to 21 minutes for medium (160-f degrees), turning once halfway through grilling. 3. Transfer steak to a cutting board and cover loosely with foil; let stand for 10 minutes. Cut steak against the grain into thin strips; cut strips into 2 inch pieces. Transfer steak pieces to a bowl and toss with any juices left on the cutting board. 1. Preheat broiler. Husk one large tomatillo and rinse it. Place tomatillo on a broiler pan. Broil 4-5 inches from the heat for 10 minutes or until soft and lightly charred, turning once halfway through broiling time. 2. In a blender or food processor combine the tomatillo, avocado, onion, garlic, habanero pepper and salt. Cover and blend or process until smooth. 1. Combine the crema or sour cream and the minced peppers in a small bowl and stir. Store in the fridge until ready to use. Carne Asada Taco recipes adapted from Better Homes and Gardens and Simply Recipes. Sharing this recipe at the following fun link parties. Ole! Those tacos look absolutely fabuloso! The chipotle crema puts them totally over the top! Pinning!